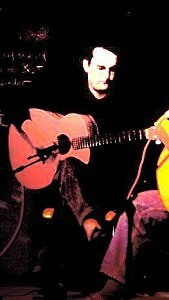 Between 1989 and 1999 I composed instrumentals for the western-style guitar. The music was mainly influenced by the players who first became known in the 1970s, when we had in Germany the folk revival. I listened for three decades to the music of the English group Pentangle (John Renbourn, Bert Jansch, Jacquie Mc Shee, Danny Thompson, Terry Cox) which became a musical symbol in my life. Playing the guitar was always an enjoyment for me, even though I decided not to study it after high school. Specifically during the time of my dissertation it was a great relief to be in the non-verbal field of guitar music. Most of the instrumentals were created in this time when my playing made a lot stylistic progress. For the reason of documentation I recorded the pieces in December 1999, in a studio of the Faculty of Music in Cairo, where I had friends and often stayed, to have such an idea which could be realised more cheaply than in German music studios at that time. Unexpectedly, a music producer showed interest and published the instrumentals as a tape, and distributed it on the Egyptian market. For commercial reasons all the German titles of the instrumentals were changed to attract the merchants on the streets. I found that surprising, and also how my music started to live for a while in this culture. It was very strange for me to find the tape in Aswan, near the Corniche, with all this nice atmosphere of light, the Nile and the feluccas. After a year the music producer sold the rights to a Greek company which made a CD out of the tape. Later, I made another three instrumentals that have one (at least for me) remarkable difference from the others: I could practise belly breathing during the playing. For the same reasons of personal documentation I recorded the pieces in a studio near Marburg, and wrote - in a first attempt - all instrumentals down in classical notation and in tablature. Following this I thought I had done enough work on guitar music and started instead to publish books where I felt a need for it. Sorry, your browser does not support the IFRAME HTML tag, so you will not be able to listen to the music files. All content © Uwe Christian Dech, 2011 - .